Home » Flavours Blog » Interview with our painting holiday guest Charlotte: It’s incredibly empowering – and great, great fun along the way! Interview with our painting holiday guest Charlotte: It’s incredibly empowering – and great, great fun along the way! Charlotte had never been abroad without her husband or children before. 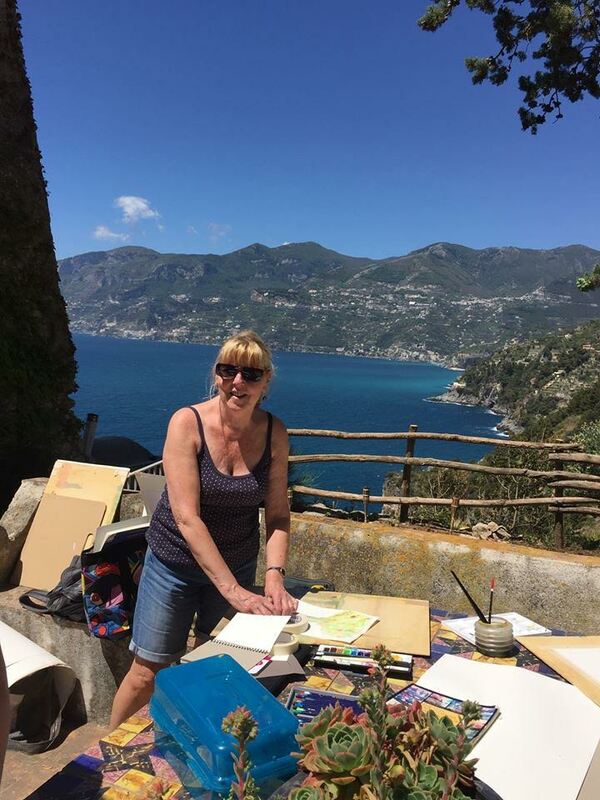 How would she enjoy her first Flavours painting holiday, travelling solo to Tuscany and Amalfi? My first Flavours Holiday to Tuscany was the first time I’d ever been abroad without the family as a solo traveller, so I was pretty anxious about flights and luggage and so on. But Flavours booked my flights for me, and there was someone from Flavours at Pisa to meet me at the airport, so really, it couldn’t have been easier. Then once we were in our villa, absolutely everything was taken care of, including excursions to neighbouring towns for various meals, all the transfers etc. It totally removed any travel stress and any problems with the language barrier. Which is why I booked to go back the next year to Amalfi. Oh gosh, just indescribably beautiful. We stayed at Villa Torre, a medieval Saracen watchtower with pine trees and lemon trellises dropping down to the sea. As a painter, the views – straight out to sea over these stunning, steep cliffs – were almost too much at times. I mean, everywhere you looked there was something you wanted to paint. I came out of my room one morning and there were some ewes and lambs right outside my door. Without any doubt, yes. The tutor on both my Flavours holidays was Hugh Tuckerman, and he is an absolute master at getting you to relax – both as a group, and as a painter. He sets you these brilliant little challenges to help you become less precious about your work. His first task for us in Amalfi was to paint a scene in five minutes. Five minutes?! Then he had us do it with the wrong hand. It’s impossible to stay precious under those conditions. Another time, Hugh had us painting with a piece of graphite attached to a long stick. It was basically like writing while holding the end of a pen – impossible, in other words. And throughout it all, Hugh always manages to find something positive to say about your work. He’s so encouraging. And Hugh never criticises your work: instead, he really encourages you to work out what it is you’re not happy with, to narrow it down, at which point he’s brilliant at offering pointers to put things right. I learned masses from him about manipulating colour. What has been the highlight of your trips? At the end of each week Hugh frames a couple of your pieces and holds a little exhibition of everyone’s work. Everyone’s invited, including the group at the neighbouring villa who were doing a cooking course. So there’s a lovely atmosphere and as someone travelling on their own, it’s a great way to meet like-minded people. It was fun having people at the villa doing Pilates, as well – it just added a bit of colour, somehow. I was tempted to join them, but hadn’t brought the right gear. Next time, perhaps. Well, Hugh’s down to lead the first ever Flavours holiday to Marrakech in March, so I definitely intend to join him there. In fact, I’ve told so many people about Flavours that someone from my gym may be coming along, too. I just think Flavours holidays are such good value: absolutely everything is included in the price, so literally the only time you get your purse out is for a coffee in town or to buy a postcard. It’s such a treat. Do you have any advice for anyone considering a painting holiday? Just go for it. Before my first holiday I fretted a bit about who would be on the course – I was worried that they’d be more serious painters than me. But you quickly realise it doesn’t matter one bit what sort of painter you are. It’s not about being good, it’s about getting better. Whatever sort of painter you are when you arrive, you go home being able to do stuff you never knew you were capable of achieving. It’s incredibly empowering – and great, great fun along the way. Are you interested in a creative painting holiday to Italy? Give our team a call and we will be very happy to let you know about availability! We also warmly welcome solo travellers, as we have never charged a single supplement for our holidays!